Born in Sydney Australia, Mark John McEncroe commenced music studies in his adulthood. He had a varied interest in many kinds of music, not just classical, which led him to working in the music / record business for EMI Records in his 20s and early 30s. For much of that time he was a Label Manager, first with EMI Australia and then with EMI Sweden. At age 37, McEncroe commenced piano lessons in earnest studying first with Will Scarlett in Sydney. Later he continued with Valerie Fawcett and then Helen Kennedy following Will Scarlett's passing. During this time, he developed an interest in composition which eventually became his all consuming passion and main focus. To this end, in 2003, he began music theory and composition study with Margaret Brandman in Sydney, which continued on and off until 2012. Not considering himself as a strictly classical music composer, he felt no compulsion to slavishly follow the current specific trends that classical composers feel they have to conform to. He deliberately writes his music for the general music public. His music is not written for the followers and slaves of "classical academia". In 2006 McEncroe began studying orchestration with Mark J Saliba, who orchestrated the piano reduction work for McEncroe's Symphonic Poem, The Passing. This work was eventually recorded and performed by The Janacek Philharmonic Orchestra in The Czech Republic. Since then, Saliba has worked in collaboration with McEncroe orchestrating much of McEncroe's material from his piano works and piano reductions. To date, McEncroe has recorded and released two piano albums, Reflections & Recollections, Vol. 1 and Vol. 2 with pianist, Helen Kennedy, a former teacher. Reflections & Recollections Vol.1 was also recorded in Sydney by Australian Pianist John Martin and released also on the Wirripang label titled "Reflections." He has also released his Fanfare Suite for orchestra; two Symphonic Poems: The Passing and A Celebration of The Natural World on the album Affirmations & Aspirations recorded in The Czech Republic with The Janacek Philharmonic conducted by Anthony Armore. McEncroe would also like to thank and acknowledge Margaret Brandman for her input and advice on some of his earlier material. Over the last few years McEncroe has recorded many works with The Janacek Philharmonic Orchestra with conductor Anthony Armore. In 2016 McEncroe signed with PARMA Recordings in the USA. In March 2017 PARMA released his album DARK CLOUDS IN LIFE which features his work for piano and orchestra Natalie's Suite - Three Faces of Addiction; Symphonic Poem Echoes from A Haunted Past, together with related pieces from his piano volumes. In August 2017 Navona Records released his SYMPHONIC SUITES NO. 1 AND 2 on a double CD. The third movement of the first Symphonic Suite was picked up by Spotify on their Classical Picks list for new releases. In September 2017 all the pieces from both volumes of REFLECTIONS & RECOLLECTIONS- MUSICAL IMAGES FOR PIANO were recorded again in Rockport MA in the USA at the Shalin Liu Performance Centre with Japanese /American pianist Yoko Hagino. The album was produced by Brad Michel. This double CD, MUSICAL IMAGES FOR PIANO was released in 2018 by PARMA Recordings on the Navona Label. The single Daybreak was picked up on the Spotify Classical Picks list. Symphonic Suites No. 1 and The Passing have now been performed in The Czech Republic. Symphonic Suites No. 1 and No. 2 were performed in Ruse Bulgaria in October 2016 with the Ruse Philharmonic conducted by Nayden Todorov. Symphonic Poem - The Passing was performed by The Janacek Philharmonic in January 2016 in Ostrava in The Czech Republic, conducted by Anthony Armore. The same orchestra also performed McEncroe's Symphonic Suite No. 1 in October 2016, conducted by German conductor Heiko Mathias Forster, the current chief conductor for that orchestra. The Gathering of Forces - A Call to Arms (Symphonic Suite No.2) was also performed in February 2018 by The Zagreb Philharmonic Orchestra at a season concert in Zagreb. A Double CD "My Symphonic Poems" comprising all his current Symphonic Poems to date will be released on the Navona label on October 12th 2018.. There are 10 works in all. Mark is currently working on a ballet project based on the music themes and story told in McEncroes Medieval Saga Symphonic Suites No1 and 2. This, the ballet, is to be a co-written project from both McEncroe and Mark J Saliba. The Fanfare Suite and Symphonic Poems The Passing and A Celebration Of The Natural World have been re orchestrated for a 33 member wind ensemble. They all will hopefully be recorded in 2018. The original versions of these works with the Janacek Philharmonic are available on his Wirripang released CD Affirmations & Aspirations. McEncroe is currently working on his Symphonic Suites No.3 and 4 along with a new collection of piano pieces about 24 in all. All these to be recorded in 2020 & 2021. 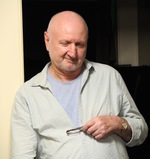 All of McEncroe's compositions to date have been published by Wirripang-home of Australian Composers.